You will see light streaming from the liquidâ€””cold” light, soft and heatless like that of the firefly. Usually the mysterious glow is yellowish-green. Chemi-luminescence is the name given to the weird phenomenon. In experiments with substances other than oil of bergamot, you may need to accustom your eyes to the darkness before performing the experiment, as the light is very faint. However, a strong glow may be obtained from the chili powder which is used in flavoring chili con carneâ€”especially the very hot kind. A single can of chili powder from the grocery store will be enough for innumerable experiments. Steep a little of it in alcohol and add alkali, hydrogen peroxide, and sodium hypochlorite as before. The resulting liquid shines plainly in the dark. Paprika powder, given the chemical treatment just described, also will glow in a darkened room, as will other spices, condiments, and kitchen staples. You will find it a fascinating pastime to try out a little of everything on the pantry shelf, to see what substance will give the strongest light. Grass, leaves, and flowers also can be used in your experiments if you macerate or grind them with the alcohol to extract the active constituents. Sometimes, in the case of flowers, the alkali will help to extract the glow-producing substance if it is added to the alcohol before soaking the plant. Instead of the liquid clothes whitener, an antiseptic solution found in many home medicine chests, technically known as a modified Carrel-Dakin solution, may be employed as an alternative source of sodium hypochlorite. Now you will be interested to make the acquaintance of the ideal luminous materialâ€”a chemical produced by recent research, capable, under certain conditions, of giving off more cold light than any other substance known. 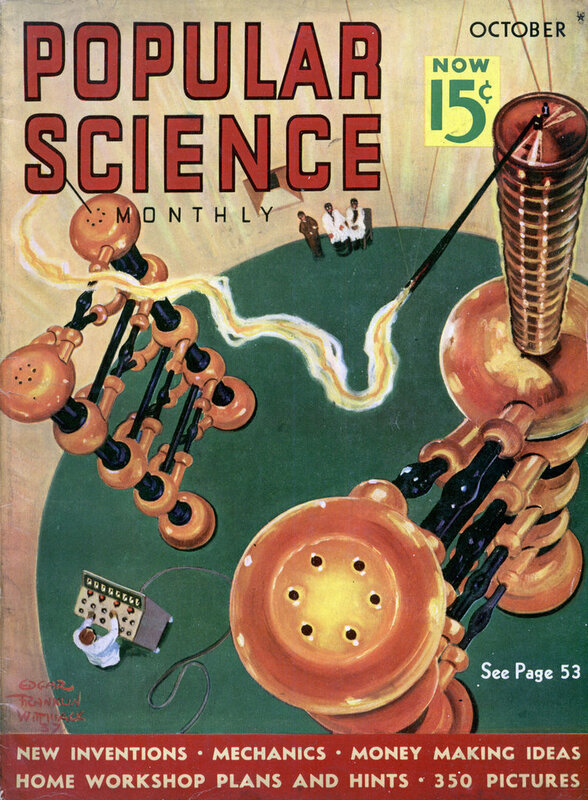 Not only can you read print by its light, but you can even wander about your darkened laboratory by its illumination. Chemists call it “3-aminophthalhydrazide,” and it bears the common name of luminol. Many dealers in chemicals can supply it, and sixty cents’ worth will provide you with plenty for your experiments. Do not confuse it with luminal, another organic chemical, which is used in sleeping tablets; this is not the material you want. For the first solution, dissolve about two tenths of a gram of luminol in about an ounce of water, which has previously been made alkaline with a small piece (about the size of a pea) of sodium hydroxide or potassium hydroxide. Ordinary lye may be used for the alkali. When the luminol has dissolved, add about two quarts of water. To make the second solution, dissolve half a gram of potassium ferricyanide (also known as red prussiate of potash) in several ounces of water. Then add about an ounce of hydrogen peroxide of drug-store strength (three percent), and dilute with about two quarts of water. If you do not have facilities for measuring the luminol and the potassium ferricyanide in fractions of a gram, use a piece of each about the size of a pea. A little variation in the proportions used will not matter. When the first and the second solutions are mixed, bluish-green light streams from them, rivaling the illumination of a ten-watt lamp. The glow lasts for several minutes, slowly dimming as time goes on. To restore its brillance, however, you need only add more potassium ferricyanide or more alkali, either in solid form or in solution. If you use the solid, the resulting glow is extremely intense near the surface, where the concentration of the newly added chemical is greatest. Stir the liquid, and it will swirl about to form beautiful luminous clouds. To enhance the beauty of the display from luminol, try putting some of the luminous mixture in cut-glass vases, many-faceted vinegar cruets, and ornamental perfume bottles. The vessels will glow in the dark as if afire. Dip a strip of lace or a piece of an old lace curtain in the mixed liquid, and then hang it up in the dark. The startling result, with every line of the pattern outlined in glowing fire, surpasses description. For any display of home magic, luminol offers fascinating possibilities. Flowers in a vase, previously sprayed with one of the two solutions, magically light up as if they were burning when sprayed with the other solution in the darkâ€”and will be found whole and unharmed by the mysterious fire when the lights are turned on again. For ar-other effect that is really startling when it is accompanied by a bit of drama in a darkened room, you can wet your hands with one solution and use a cloth moistened with the other one as a towel. (Be sure to wash your hands carefully to remove the chemicals, when you are through.) Weird and fantastic decorations for a magical seance can be made by winding cloth tape around stiff wire bent to represent thunderbolts, serpents, and other symbols, and letting the luminous mixture of the solutions trickle down the cloth. 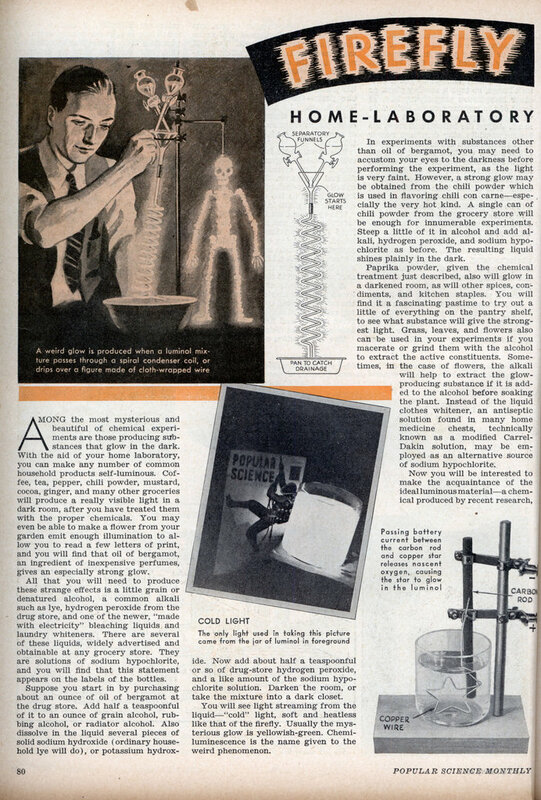 If you can obtain a glass coil or worm, such as is used in some types of laboratory condensers, you can produce a beautiful spiral column of glowing lightâ€”a sort of “witch’s lamp”â€”by allowing the luminol mixture to drip through it. The source of the liquid will be invisible in the dark if you keep the two solutions apart, in a pair of separatory funnels which release them drop by drop, and let them mix just as they enter the glass coil. A FOUNTAIN of light that will make a gorgeous display of radiance can be constructed from a pair of gallon jugs. Fill one of the jugs with the glowing luminol mixture and let the fluid siphon into the other jug, which is inverted and supported at a lower level. The lower jug is fitted with a two-hole cork carrying a medicine-dropper nozzle, through which the luminous fountain spurts upward within the vessel, and another glass tube for a drain. The height of the resulting fountain depends upon the difference in level between the two jugs. A screw-type pinch clamp on the rubber tubing connecting the jugs will help to regulate the flow and turn the fountain on and off. For sure-fire results in chemical magic with luminol, use freshly made-up solutions and do not combine them until the moment arrives for your display. It is possible, however, to keep the separate solutions as long as several days, the one containing the hydrogen peroxide being the first to go stale by losing some of its oxygen. Chemists do not fully understand the strange phenomenon of cold light. Oxygen evidently plays an important part in it, however. Omit the hydrogen peroxide from the mixture of chemicals used in the luminol experiments, and you will get no light. Suppose you try to supply oxygen in some other wayâ€”by blowing your breath, for instance, through a solution containing only luminol, alkali, and potassium ferricyanide. Still you get no glow. Does it take oxygen in the peculiar nascent or active form that hydrogen peroxide liberates, to make luminol glow? You can readily find out. Decomposing water with electric current will also liberate nascent oxygen, and you can show that this will enable you to dispense with the hydrogen peroxide. FOR this interesting experiment, dissolve a bit of luminol in water that has been made alkaline with a fragment of sodium hydroxide or potassium hydroxide. Also stir in a small crystal of potassium ferricyanide. Then pass a current of electricity through the solution. The source of the electric current may be three dry cells wired in series, or so that the electric circuit passes through each in turn. Connect the positive (center) terminal of the combination to a copper wire bent into the shape of a star, and the negative (outer) terminal to a carbon rod. When the star and the rod are immersed a short distance apart in the liquid, to serve as electrodes, current passes through the solution. Darken the room and you will see the wire star glowing with a soft blue light. Evidently the new-born oxygen liberated at this electrode makes up for the absence of any hydrogen peroxide in the solution. To observe the glow best, arrange the electrodes with the star on the side nearest you, since the action of the electric current gradually darkens the liquid and dims the light. A mayonnaise jar with the top cut off makes a neat electrolytic cell, or receptacle for treating liquids with electric, current, in experiments like the one just described. You will be surprised to find how cleanly you can remove the tops of these jars with the aid of an easily made electric bottle cutter. It will also cut glass tubing of any diameter larger than half an inch, and bottles of all shapes and sizes. This handy device consists of a length of nichrome wire to which ordinary house current is supplied through a pair of electric heating elements. The latter are connected in parallel. TO CUT a jar or bottle, file a mark I around the entire circumference where the break is to be made. Then plug the cord of the electric bottle cutter into an outlet, and hold the scratched mark on the glass against the red-hot nichrome wire, turning the jar or bottle constantly. Presently a crack will start. Continue rotating the glass vessel, however, until the crack has traveled all the way around it. Then the halves will fall apart of their own accord, or can easily be drawn apart. Emery cloth or an abrasive stone will smooth and round the sharp edge. By using a large enough loop of nichrome wire, even gallon jugs may be cut in two. When a dye called fluorescein is used instead of luminol, the fountain-of-light apparatus will yield another spectacular lighting effect. Unlike luminol and other substances that glow of their own accord, fluorescein produces light of its own only when it is illuminated. Dissolve the merest pinch of the dye in water, together with a bit of alkaliâ€”say, sodium hydroxide or lye. The liquid glows or fluoresces when light strikes it â€”particularly ultra-violet lightâ€”and the yellow solution turns a queer, bluish color. An argon bulb, obtainable from any dealer in electrical supplies, makes a good source of ultra-violet rays for this purpose. As a matter of fact, an ordinary ten-watt lamp can be used, but the visible light that it gives off will make the effect much less spectacular. If you let the alkaline solution of fluorescein run through your fountain, and suspend the argon lamp just above the lower jug, you will obtain a beautiful display. From a time before God turned his back on mankind and the letters U.S. A. meant so much more! this is sooooo confusing i am confused how does it work again? Uncle B is your name bozo?